Cut 1/2 inch off top stem end of each bell pepper. Remove seeds and membranes; rinse peppers. Remove stems, and chop any bell pepper from tops (about 1 1/2 cups); set aside. In 10-inch skillet, cook sausage and crushed red pepper over medium heat 8 to 10 minutes, stirring occasionally, until no longer pink; drain. Remove to large bowl; set aside. In same skillet over medium heat, add onion and garlic; cook and stir about 3 minutes. Add chopped bell pepper; cook 2 minutes. Add zucchini; cook and stir 2 minutes. Stir in tomato paste, pepper and salt. Stir in spinach; cook until wilted. Remove from heat. Add farro to sausage in bowl; mix to combine. Add onion mixture; mix well. Gently stir in 2 tablespoons of the basil, the oregano and 1/2 cup of the shredded cheese. Divide farro mixture evenly among peppers. Pour 1/3 cup water in 5- to 6-quart oval slow cooker. 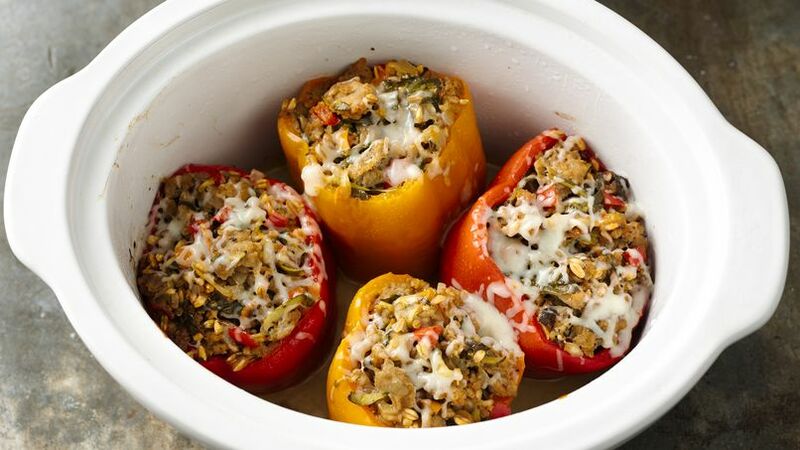 Place stuffed peppers upright in slow cooker, leaning against each other and the slow cooker to prevent them from falling over. Cover; cook on Low heat setting 4 to 5 hours or until peppers and farro are desired tenderness. Sprinkle remaining cheese evenly over tops of peppers. Cover; let stand 3 to 4 minutes or until cheese is melted. Using tongs and slotted spoon, remove peppers to serving plates. Sprinkle with remaining 1 tablespoon basil. Be sure to use pearled farro for this recipe--it cooks faster than whole farro. Look for pearled farro in the natural food section of your local grocery store, or order it online. Store leftover peppers tightly covered in the refrigerator, and serve within 2 days. Look for large, sturdy bell peppers with square bottoms. This will help the peppers stand in the slow cooker. Try this Italian twist on stuffed peppers using farro and turkey sausage.